I never use any face wash..yes...NEVER. I am too satisfied with the home made pack/scrub that I am using for last 13 years by now. I rarely use the foam of a mild face wash like Clean&Clear if the need be. Once Saturday of last december when I was just killing time in Saharaganj mall in Lucknow, I saw this black beauty - instant love (How many skincare products come in black packing other than the Lush ones?) As I am always afraid of SLS, I saw the ingredient list. To my surprise I could not see any sulphate! Its very strange as even the Lotus White Glow scrub has SLS! All I could see was fatty acids, carbon and EDTA to hold carbon! I googled almost every ingredient and found all are almost safe.A sulphate free face wash! Price: 125 INR for 100gm is not at all hurting. So I grabbed it. Also available in smaller size. I directly went to the wash room to try it out. The self realization took me seconds to hit. 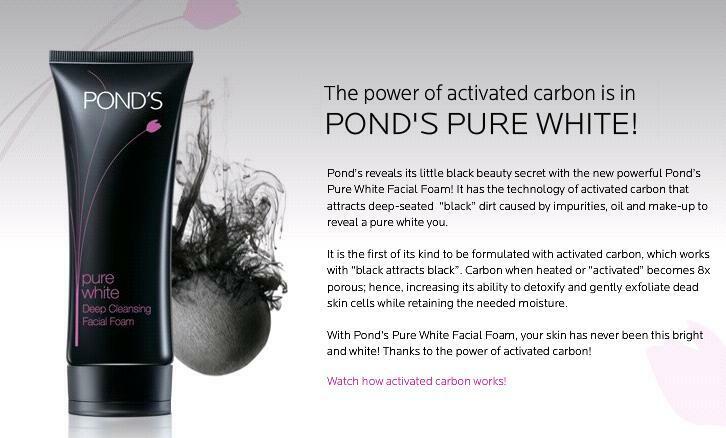 Ponds products are never bad but for dry skin one should use very very little and only apply the foam not the face wash directly on face...in my excitement I forgot all. I used too much - more than a pea size and ended with tight skin. Luckily I had the Vaseline Total Moisture Cream to rescue me. Other than that its OK.
All in all this is just a nice face wash and does nothing more than cleaning your face. But I personally will never use it everyday. Smell - Bit lemony but nothing strong. Sort of like a male cologne. Some might not even recognize anything. 2. It is not manufactured in India. Just like the Lakme Earth Trio, this is manufactured outside India (in this case Indonesia) and imported by HLL. Final Verdict - Dry skin ladies might not like it at all as it might not do anything special. I am sure it not going to give any fairness. Are you kidding? fairness by face wash! Please tell me the logic here. It may just give a glow and a clear feeling. Also, the package only says - "Reveals your pure white looking skin". So see no claims of making you fair. Oily skin ladies might like it but then it does nothing very special. It can be very well used to remove makeup but then for eyes you will have to use to a different makeup remover. Re-purchase - No. Thinking how will I finish it up? It will last very long for me as I need to use very very little. The active agents will not be effective anymore after few months so maybe after that I will make a hand wash with this by adding few ingredients .. *thinking* The striked out was what I wrote after a week of random use. A week after that I lost it. When I started to blog, I told myself that I will never buy stuffs just to blog but stuffs that I normally buy. This thing broke the whole clause. I actually repurchased to photograph and swatch the product (remember every-post-must-have-pic and pic-must-be-mine diseases?). By the way I even found my favorite Boot's Hair Treatment in that same shop :). Have you used this? How was your experience? Otherwise, will you buy this? Another NewU Haul + Sale Alerts!